The AK-47 and AK-74 are both Russian-made assault rifles designed by Mikhail Kalashnikov. The AK in the name refers to Kalashnikov (K) automatic (A) rifles and the numbers refer to the year in which they were designed (1947 and 1974). In 1978, the Soviet Union began replacing their AK-47 and AKM rifles with a newer design, the AK-74. 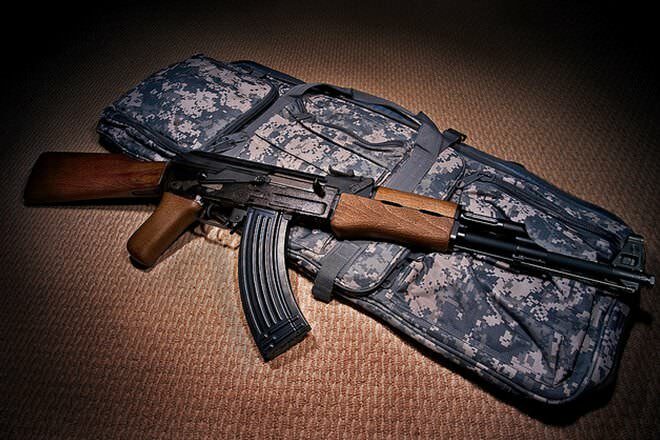 AK-47 stands for Kalashnikov automatic rifle model of 1947. It is a selective fire, gas operated 7.62x39mm assault rifle. Most 47's are actually the 1959 AKM. AK-74 is a 1974 update of the AKM. No federal restrictions on semi-auto variant ownership in the US. Full-auto restricted in the US. No federal restrictions on semiautomatic variants. No transferable fully automatic examples exist. Developed in the USSR by Mikhail Kalashnikov in the late 1940s. Developed in the 1970's due to Soviet fears that the American 5.56 cartridge was a breakthrough that needed to be imitated. Mild, but easily managed in semiautomatic Barely noticeable; lighter than 5.56 recoil. 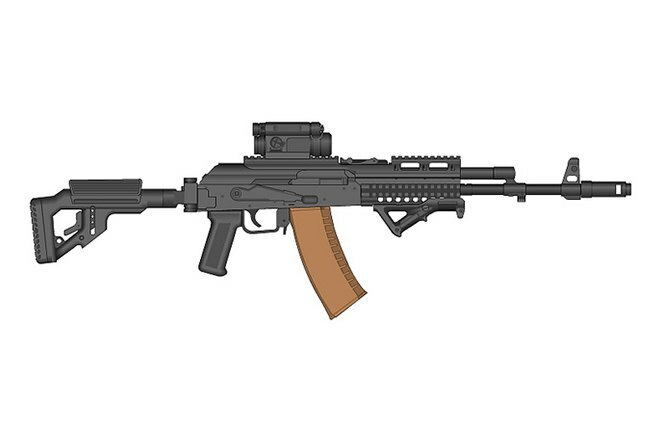 The AK-74 featured a new stock, handguard and gas cylinder. The stock has a different, rubber shoulder pad that is serrated for increased traction. There are weight-reducing lightening cuts on each side of the buttstock. The AK-74 gas tube has a spring washer attached to its rear end designed to retain the gas tube more securely. The lower handguard is fitted with a leaf spring that reduces play in the rifle's lateral axis by keeping the wood tensioned between the receiver and the handguard retainer. All external metal surfaces are coated with a glossy black enamel. The 5.45x39mm cartridge of the AK-74 makes it a more accurate and reliable rifle compared to the AK-47, which uses a 7.62x39mm cartridge. The barrel length of the AK-47 is 415 mm (16.3 inches) and is similar for the AK-74 except for the AKS-74U model which is 210 mm (8.3 inches). The AK-74 barrel has a chrome-lined bore and 4 right-hand grooves at a 200 mm (1:8 in) rifling twist rate. The front sight base and gas block were redesigned. The gas block contains a gas channel that is installed at a 90° angle in relation to the bore axis. The forward section of the front sight base features a threaded collar that is used to screw in a newly-designed multifunction muzzle device (performing the role of a muzzle brake, recoil compensator and flash suppressor) or a blank-firing adaptor. The distinctive muzzle brake features a large expansion chamber, two symmetrical vertical cuts at the forward end of the brake and three vent holes positioned to prevent muzzle climb and lateral shift to the right (for right-handed shooters). Magazines for both rifles are similar except for the minor changes in dimensions to accommodate different size cartridges. AK-74 magazines are polymer, and have a raised horizontal rib on each side of the rear lug to prevent their use in a 7.62x39mm AK. At 3.03 kg (6.7 lb), the AK-74 is lighter than the AK-47 which weighed 4.3 kg. The lightest variant of the AK-74 was the AKS-74U that weighed only 2.5 kg. The AK-74 is cheaper to manufacture for mass production than the AK-47. Accessories for these rifles, as well as the Airsoft versions, can be purchased on Amazon or other gunshot accessories retailers. As both the AK-47 and the AK-74 were designed by the Soviet Union, they were never controlled by copyright law or patents. This enabled any country or manufacturer to produce versions of the assault rifles (some better than others). Between this fact and the nature of the assault rifles' design—that they were easy to manufacture and use, reliable, and inexpensive to replace—the AK-47 and the AK-74 are ubiquitous in many nations around the world. It's even roughly estimated that nearly 100 million AK-47s are in circulation. Pretty good review, until i read about the ergonomics.. "while the trigger is operated by the middle finger or the ring finger." Trolling or just being dumb? Operating the trigger with anything but your index finger would result in twisting your hand and not getting a good "squeezing motion" on the trigger. In other words, you wouldn't hit anything. In reference to the top comment about a 7.62x39 AK-74. There is not an AK-74 chambered for that cartridge. The AK-74 was built around the 5.45 round in an attempt to mimic the M-16's excellent performance with the 5.56 cartridge. There is however the AKM, which is a modernized AK-47 which shares many of the same characteristics of the AK-74. Not trying to be a troll, but the AKM and AK-74 are completely different firearms. AK-74's are exclusively chambered for 5.45x39. If you have an AK-74, then it's chambered in 5.45x39mm... period. Seems to me the confusion here has to do with the Century series i.e. rifles that follow the AK-74M design but are chambered in 7.62x39mm or 5.56x45mm, such as AK-103 or AK-101. Those are different models, not re-chambered AK-74's. encompasses many design changes in terms of finer points while sticking to the "basic"
diffeences in size between a frog hair and a blonde pubic hair. What's the point? Golden Boy, then it is no longer an AK47.